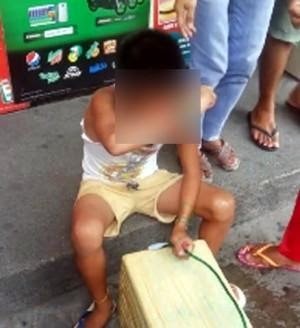 My heart lurched so much seeing the viral video of the 12-year old pandesal (salted bread) vendor who was robbed at knife point with his hard earned money. The sight of him trembling, fearful for his life, and traumatized after the incident as captured in the video had me thinking of a lot of things and made me question of a hundred more. When I prayed for him and our country, the tears welled like Niagara Falls. I never realized there is a lot to pray for. Now let me ask you, is this really the life that we want our children to see? Do we really need them to live in fear? Do we have to steal their childhood? Do we really have to have a community when an older guy has to mug a child in order to feed himself? Is nabbing really has something to do with feeding his family as well or is it to finance his addiction? I apologize as early as now, I am not really to judge but I want to express my sincere concern and in a way shout my cries for a peace of mind. For me, the young pandesal boy just represents a lot of hard-working minimum-waged Filipinos and their sacrifices just to meet both ends. And how disturbing it is to have billions and billions of projects, some of which are going directly to the pockets of some in authority. I wonder when they sleep at night; do they even know the feeling of stomachs churning of hunger? I believe this will ignite blame after blame like fireballs from one side to another. I guess each party has to blame. But we really don’t have to blame. We have to act instead. In the end, it all boils down to something greater. I remember our Pastor sharing us this thought that he also learned from a TV guesting of a certain professor in a reputable university in Manila. I forgot the exact phrases but it goes like this, “We failed as educators. Yes we trained great leaders, mighty leaders of our country today. But we did not instill them to be God-fearing”. I guess, it is not just our leaders that need to realize this, but it is for every one of us to understand. Whatever walk of life you are in right now, if you love God, and you have a greater relationship with Him, it will then be hard for one to commit a sin (either petty or heinous). What our society really need is a spiritual awakening in order for us to be steadfast with the teachings and the doctrines of the Lord and not just to live in accordance with the law of men. God is so powerful that He can definitely eradicate poverty. We are just so worldly that’s why we always crave for more. But we still can change that route. I pray thee for every child in our nation, for the Lord to spare us from His wrath, for the repentance of criminals and sinners, for the awakening of those in power, and for every one of us to live a life being God as the center. Jessie Corpuz-Dericto, 29 years old is a Freelance Writer, Blogger, Virtual Assistant and a nursing mom. She is also into news and trends, fashion, photography, painting, sketching and the roller coaster ride of motherhood. She loves sensible talks, long walks and activities that will enrich both the mind and soul.